My faith crisis hit me me right in the middle of raising children. For about ten years I’ve been trying to decide how/if to teach my children in a different way than I had previously, which was a very literal and faithful approach. Even though I lost the literal belief in the origins of Mormonism, I never lost my faith in God. I never lost my love for Mormonism. For several years, I’ve been formulating the logic to support the sacramental approach to Mormonism as I define here on this site. During that time, I’ve also been trying to figure out how to teach my children in an authentic way that would inoculate them against historical challenges while not harming their testimonies. The concepts I introduce on this site are difficult for adults to comprehend, let alone children with developing brains and not enough experience and maturity to see all angles of the issue. This is why I think the millennials are getting hit so hard with this faith crisis issue. My 12 year old son is analytical and inquisitive beyond his years, has a knack for science study, and lately has been talking in a way that concerns his more literally believing mother. I have been praying and thinking hard the last few weeks how to introduce the metaphorical paradigm to him in a safe and gentle way. I decided to use our priesthood session father-son outing to have a long talk about the subject. I introduced the subject with a discussion of Noah and the flood. It was a challenging discussion, but I felt good about it. I felt like I accomplished what I wanted. I hope he came away with an expanded ability of being able to make sense of historical and scientific facts that seem to disprove religious historical origins, while retaining a faith in God. Most of all, I felt I connected with my son and we both felt deeper love and understanding for each other. I looked out the window of my car as we finished this talk, and what do I see? 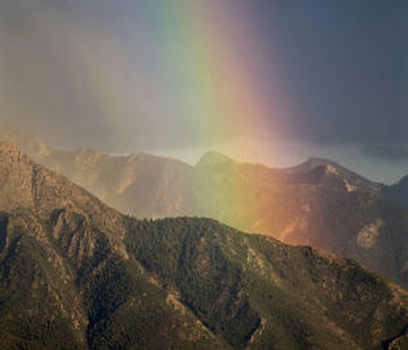 A beautiful rainbow stretched over the Wasatch mountains of the Salt Lake Valley. The sign that God promised Noah he would send to show he would never forget man. That he would always be with us. Brethren, I testify that even in the toughest of times, the Savior will say to you as He said to an anxious father on a crowded street in Galilee: “Be not afraid, only believe.” We can choose to believe. For in belief, we discover the dawn of light. We will discover truth. We will find peace. Maybe it’s not literal belief in papyri or seerstones or the Garden of Eden, but it’s that basic belief that God might be there. He might be there listening, watching. He might care about a talk a father and son have in the car on the way to priesthood meeting. He might send a rainbow every now and then just to remind you.